Snow Patrol are no strangers to Australian audiences after selling out multiple tours and headlining arenas across the country. And when Snow Patrol return to Australia this month in support of their latest release A Hundred Million Suns (out now through Universal), they have confirmed that they will perform a one off intimate show. The Frontier Touring Company are pleased to announce this exclusive show will take place at the Metro Theatre on Wednesday 19 November during their stay. 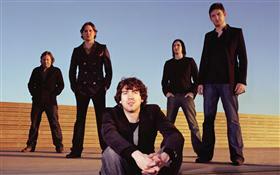 A Hundred Million Suns sees Snow Patrol exceed all expectations as they release their most accomplished record to date. Debuting at #6 on the ARIA chart, and already certified Gold, Australians have proven their love for Snow Patrol has not waned. With previous tours in much larger venues selling out, this performance offers fans the rare opportunity to get up close and personal with Snow Patrol as they showcase their new material. Tickets will be available only via the Metro Theatre (via phone, web and box office) from 9am Tuesday 18 November. It’s not often the opportunity to see a band as revered as Snow Patrol in an intimate setting arises, so ensure you don’t miss out.